Believers hope someone can figure it out when Jesus is coming back and tell us so we know how how much time we have left. I was the same, hoping that the Bible had the timing hidden away somewhere there among all the many numbers in Daniel and Revelation. Yet the record of history shows that date setting calculations always fail. What are they missing? The key is to understand the purpose and limitations of Bible prophecy that Jesus explained but most date setters overlook. Learn how to identify manmade prophecies which always fail and how to correctly use end times Bible prophecy. Also, the dilemma of God giving me dreams confirming dates of my own for literal prophetic events! If I had to identify what was most responsible for keeping Christians from achieving correct understanding of end time Bible prophecy, what would it be? What's the biggest barrier stopping them? My answer would be that the main reason Bible prophecy aficionados keep misunderstanding Bible prophecy is because of popular date setting prophecy inventions. By that I mean the practice of Christian authors inventing a compelling prophecy based on a verse or two and attaching a date to its fulfillment. This one-two combo has produced many persuasive theories in recent years. A few are convincing enough to spread and put prophecy fans in fear of the end being "nigh." For one example just look at 2017's "Revelation 12 sign" theory  that was much ballyhooed but failed to predict anything specific that happened. Unfortunately, most don't see this pattern of invention an failure. They figure out that the prophecies are false after their associated dates pass. That's why in this article I want to help you learn to recognize invented doomsday date prophecies as soon as you see them so you never fear one again! At the same time, I will share what I learned about this subject when God gave me insight and then dreams that pointed to a date of my own! Predictions about the future have been with us from time immemorial. Lately the practice of prediction has become epidemic. Since the World Wide Web entered the culture in 1995, it has been possible for anyone to get a website and publish their ideas to the world as text and pictures. In 2007, the advent of YouTube expanded this ability to include video (initially limited to only 10 minutes for free publishers). Social media like Facebook also has magnified how much good and bad ideas (like Flat Earth ) are spread. With the floodgates open, every conceivable theory for when and how the world might end has been unleashed—from both Christian and secular theorists. These theories then quickly find people who are not equipped with the necessary experience and critical thinking skill to resist them. This causes much anxiety. But what specifically do I mean by "date setting theories?" Date setting, as I use the term, is any type of invention of an imagined event that must or should occur at a certain time. Typically it comes in the form of a stated date or year. However, it may be more vague such as “Damascus will be destroyed in the next 12–18 months.” That's date setting, too, because the person still claims some kind of special precognition for what the future will hold, even if their crystal ball is less exact. The basis for these dates comes in several forms. Most popular is the use of the Bible. You've no doubt seen the many permutations of time calculations derived from numbers in the Bible. Such schemes include day-year/day for a year, “360 day prophetic years,” or even “week for years” (e.g. the idea that Daniel's 70 Weeks also work as 70 years). It is not off limits to claim a “word from God” or use Nostradamus, ancient calendars like the Mayan, or eclipse charts. I have even seen a stock market average (666, of course) at closing on some day made to be prophetic. Whatever the basis of the argument, date setting always comes with a sense of inevitability. In other words, given all the evidence, it would make no sense if nothing happened by the end of the time period. The rationale is usually so compelling, unique or special that many fail to find fault with the theory, to poke holes in it. For example, sometimes date setters will say that "no other similar celestial alignment happens again for hundreds of years...so this must be fulfilled in our time." Since every generation has prognosticators arguing that “things are so bad that they can't go on much longer like this before the end,” it all seems reasonable that we should be the generation to see the end come. And therein lies their appeal and the key to their viral nature. A person studying Bible prophecy does it fully or partly because he hopes to find out when Jesus is coming back or when some other prophesied end times event will happen. Dates setters come along and offer hope that this is indeed possible. Unfortunately, just as a typical prophecy aficionado does not have the ability to work out a date himself, likewise he does not have the ability to debunk a typical doomsday date he hears. It is sufficiently complex and compelling that he cannot absolutely prove it wrong. So what are we to do? We ask someone else what they think, if they can say if it is right or wrong, by emailing them or sharing it on social media. In this way the doomsday date gets spread widely, each person telling other friends and so on and so on and so on. This is why doomsday dates spread and become so rampant. Ironically, most people spreading a doomsday date do not do so because they are convinced by it. In fact, they probably seriously doubt it. They just cannot for sure rule it out 100%. So they share it to see if anyone can help. Those who read it likewise get concerned or even scared and share it with others to see if they can debunk it. Where would we be without email and social media? It does seem somewhat reasonable as Jesus or other prophesied doomsday events must come at sometime. So why not at some proposed date? Anything is possible, right? Or so we reason or tell ourselves. But is mere possibility enough? What I like to remind people is that something being possible does not make it worthy of our attention. For example, it's possible that a meteorite can smash through the roof of your house and cause massive damage or even kill you. Should you therefore invest in steel plating for your roof? Of course not, because you know that the chance of it happening is too remote to justify such expense. It's just not probable enough. Similarly, a specific disaster happening on the same date someone picked is highly improbable. It's even more improbable than a meteorite hitting your house. We can know this because if we look at the history of date setting. The track record of someone or something is a very good “predictor” of the future results or behavior. Let's review just a few of the dates that have been set in recent history to get a sense of the nature of date setting. Comets have long been superstitiously considered a bad omen by mankind. The discovery in 1881 that comet tails contain a deadly gas related to cyanide (named cyanogen) added a scientific dimension to comet loathing. When it was realized that the earth would actually pass through Halley's tail in 1910, people speculated that we all might be poisoned. Several newspapers including the New York Times published this theory, causing widespread panic. People even bought “comet pills” and bottled air to survive the fated day of May 20, 1910. It turned out as most scientists had said. The gas would be too dispersed to do anything. In 1974 John Gribbin, Ph.D., and Stephen Plageman wrote a best-selling book The Jupiter Effect about the coming planetary alignment of 1982. With seven of the planets including Jupiter aligned on the same side of the sun, they predicted that tidal forces would bring a number of catastrophes including a great earthquake. Twenty-five years later, Gribbins wrote of his failed theory, “...I don't like it, and I'm sorry I ever had anything to do with it." Television evangelist Pat Robertson, like many Christians, believes that God gives him words or revelation on a continual basis. Based on one of these words, he proclaimed in a 1980 TV broadcast that, "I guarantee you by the end of 1982 there is going to be a judgment on the world.” He expected the Gog-Magog Russian invasion of Israel to kick off the Great Tribulation that year, preceded by the rapture of the just. This failed false prophecy did not seem to deter him as he ran for president six years later. Whisenant was a former NASA engineer and Bible student who became convinced that the rapture would happen on Rosh Ha-Shana 1988. How convinced? The title of his book sums it up well: 88 Reasons Why the Rapture Will Be in 1988. It sold 4.5 million copies and 300,000 more were sent to ministers across America. TBN even interrupted its programming for the three days that Rosh Ha-Shana covered that year with special programming on the rapture (including what to do if you were left behind). When nothing happened, Whisenant did what the Millerites did and most every failed prognosticator does: he found a previously unnoticed flaw in his calculations and issue a new corrected date. Due to the “fool me once, shame on you; fool me twice, shame on me” effect, he had much less success with getting people to pay attention. He kept going on creating dates every year or so for a several years until he finally seemed to give up before he died in 2001. Another comet, another panic. This one did end in disaster—but not the one expected. Instead of the threat of cyanide gas, this time an amateur astronomer claimed to have photographed an alien spaceship following the comet. Although refuted by professional astronomers, the Coast to Coast A.M. show with Art Bell perpetuated the rumor by offering further evidence from an anonymous astrophysicist. A few months later the Heaven's Gate cult interpreted these rumors as a sign the earth was doomed to perish in “apocalyptic flames.” To escape this fate they decided to commit suicide when the comet was at its closest approach, thinking this desperate act would hitch them a ride on the spaceship. Thankfully outside of the cult, the earth was unaffected by the comet's passage. In the late '90s alarmists began to sound the trumpet about a computer problem first noted in the early 1970s. Many computers had a bug that would treat the dates past the year 2000 as 1900 dates. No one was really sure how bad the result would be, but many predicted serious problems such as power grid failure or nuclear war. In response, sales of guns, ammo, survival foods and goods, gold and silver spiked and some people moved out of the cities and prepared bunkers there. Many Christians got caught up in the speculation. Jerry Falwell and Pat Robertson and many other ministries suggested that this date could be the fulfillment of major Bible prophecies such as the return of Jesus or the destruction of America. January 2000 came and went with only minor disruptions. It is still argued whether this is because billions of dollars were spent worldwide to fix the problem or because the problem was overrated. May 5, 2000 marked a rare planetary alignment of the sun, moon and five planets (see NASA chart ) dubbed a “Menorah Alignment” (a menorah has seven lamps). Such cosmic alignments are perennial inspirations for doomsday dates (2012 is based on another rare alignment) and this one was no different. Richard Noone was one person so concerned about it that he authored a book in 1997 titled "5/5/2000 Ice: the Ultimate Disaster" to explain why. Noone believed that the Antarctic ice mass would be three miles thick by May 5, 2000 and this ice would be shifted by a pole shift right to the equator. Noone argued that previous pole shifts had caused previous ice ages and "almost unimaginable results" would happen again. I never read the book, but I wonder if he addressed why the stronger alignment of all nine planets in 1982 as detailed The Jupiter Effect did not cause any catastrophes. May 15th, 2003 was a doomsday date based on a very unique source: extraterrestrials. Nancy Lieder of Zetatalk claimed to be channeling aliens that told her Planet X would pass earth bringing disasters on that date. If you were active on the Internet or had friends who were (like me) you might of heard of this one. Since nothing happened, other dates for Planet X have been set by the "Planet X Community" since then. The latest they have picked is 2012. That's right, the date of the Mayan calendar's long count cycle end. Any guesses as to how successful this one will be? BTW, if it was not for this doomsday date, this article might not exist. The reason is due to the silver lining of date setting. It is provocative and gets attention. It forces people to stop and look into some big questions and open up their Bibles (something most Christians normally don't do much). Myself, I was already studying the Bible intently by 2002, but this date for a doomsday Planet X to come (May 15, 2003) got me wondering if the mysterious Wormwood of Rev 8 was not a prophecy of the same thing (instead of the Chernobyl disaster)? 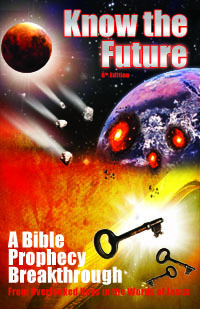 The rest is history and I wrote my first book Planet X in Bible Prophecy (later expanded to Know the Future). Ronald Weinland, pastor of the Church of God - PKG, claimed to not only be a prophet of God, but also, along with his wife, the Two Witnesses (of Revelation 11). In his book 2008: God's Final Witness he stated that “By the fall of 2008, the United States will have collapsed as a world power, or it will have begun its collapse and no longer exist as an independent nation within six months after that time." His book was a free download read by many. People began emailing me about Harold Camping and May 21st, 2011. Camping predicted “Judgment Day” and the rapture on that date. Camping's claims (“THE BIBLE GUARANTEES IT”) were easy to handle because he was a repeat offender date setter. In 1994 he predicted Christ's return for the end of the eight day Jewish festival of Sukkot (on September 27). So all I have to do is direct people to a link documenting this  and instantly his prediction loses its allure because it comes from a failed prophet of doom. Thus, it's no surprise that his prediction failed. As covered below, a big reason that doomsday dates get a hold on people is because they seem new and reasonable (even when they are not). When you find out this is not the first doomsday date this person has tried, you become negatively biased against whatever they are predicting now. Harold Camping's prediction was in opposition to what Jesus taught about figuring out the date of the end. Nevertheless, I personally received many inquiries from people wondering whether to believe it or not. What I said to reassure them and get them to not worry about that date is what the rest of this article will teach. Discovered by Russian astronomer Leonard Elenin in December, 2010, this 3-4 km sized comet will come closest to earth in October, 2011. But not that close; about as close as Venus comes to earth or 0.23 AU. Nevertheless, this comet had been the subject of much doomsday speculation and conspiracy theory for 2011. Nothing happened with it. I already wrote in a previous article about the Mayan Calendar 2012 . But Recently it got worse for 2012 as it came up in the news that 2012 may be based on an erroneous assumption causing it to be off by 50 or 100 years. However, other experts like Dr. Allen Christenson say there is no error . The date is confirmed through major historical and astronomical events. Nevertheless, he is not a believer in any of the doomsday speculation surrounding 2012, even if it is the right date. After Mark Biltz  noticed that there were four lunar eclipses across 2014-2015 , he wondered if it was what Revelation 6 and Joel 2 were referring to. Many people piled on like John Hagee and it became a huge book and video industry. Like Mark Biltz before him, Scottie Clarke noticed a rare astronomical alignment that seemed to match something in the Bible. He thought Revelation 12's woman clothed with the Sun was being fulfilled in 2017 . Since Revelation 12 predicts nothing around that sign but ties it to the first coming of Jesus, it was left to the imagination what would happen. Of course, again, nothing expected did. What can we learn from a review of so many failed date setting attempts? A couple important things that everyone new to date setting wishes they knew right up front. 2. "Bible-based" predictions fail, too, because they are invented and manmade – The other key insight is to realize that even the Bible-based date setting always fail. Why? It's because they are still fundamentally invented prophecies just like the non-Bible based ones are, such as the Y2K 2000 or Mayan Calendar 2012 predictions. They are invented because rather than take a literal prophetic event like say the clear destruction of Damascus (Isaiah 17:1), they are usually taking a verse in prophecy and inventing a new meaning for it, outside its context. We last saw this in 2017 with the "Revelation 12 Sign" prophecy. It took a sign in the sky literally related to Jesus' birth and decided because it was appearing in the sky again, that it must mean his Second Coming or something else "great" (it says it's a "great sign"after all). Sadly, it can take years of trial and error before a prophecy aficionado realizes the above two points. Once they do, date setting loses its appeal and its hold on them. Nevertheless, they may only reluctantly let go of it because we all naturally want date setting to work. We want to know when things are going to happen. We further expect that Bible prophecy should be able to tell us this if nothing else can. If it cannot, then what good is it? We cannot see what Bible prophecy is “good for” until we first completely let go of using it for specific date setting or the expectation that Bible prophecy should tell us the exact answer to “when?” Now, if what I have said above was not convincing enough, then maybe what Jesus had to say will do the job. He told us what prophecy was for, including first telling us what it is not for—finding out when. In so many words, Jesus stated that no man could know the time of the end until it was upon them. Matthew 24:36 (HCSB) — Now concerning that day and hour no one knows—neither the angels in heaven, nor the Son—except the Father only. Matthew 25:13 (HCSB) — Therefore be alert, because you don’t know either the day or the hour. To some people these words are pretty clear. To others not. To be sure, prophecy aficionados who set dates have all heard these famous words of Jesus. (People who disagree with date setters are sure to quote these words to them.) So why do Bible theorists not see or accept what the words plainly mean? I can explain that from personal experience. I used to be one of those people who disregarded these words. I had just started studying prophecy seriously in 1999 for the same reason that so many do. I wanted to see if all those figures in Daniel and Revelation did not reveal the timing of the end of the age. I knew the above verses very well but I had twisted their words into a meaning that was detached from their immediate context. In defense of my pastor, he was not alone in his thinking. There are other ideas people adopt which end up neutralizing Jesus' admonition to not treat the Bible as a doomsday date factory. For example, another common teaching today is that “of that day and hour knoweth no man” is a Hebrew idiom for the Feast of Trumpets. I think this could be true and can readily explain why Jesus used the complicated phrasing he did, rather than just “time” which is what the day or hour is equivalent to in its New Testament usage. However, the plain meaning of the words would still remain and could not be contradicted. Matthew 24:42-44 (HCSB) — Therefore be alert, since you don’t know what day your Lord is coming. 43 But know this: If the homeowner had known what time the thief was coming, he would have stayed alert and not let his house be broken into. 44 This is why you also must be ready, because the Son of Man is coming at an hour you do not expect. Matthew 24:48-50 (HCSB) — But if that wicked slave says in his heart, ‘My master is delayed,’ 49 and starts to beat his fellow slaves, and eats and drinks with drunkards, 50 that slave’s master will come on a day he does not expect and at an hour he does not know. Matthew 25:11-13 (HCSB) — “Later the rest of the [unprepared] virgins also came and said, ‘Master, master, open up for us!’ 12 “But he replied, ‘I assure you: I do not know you!’ Therefore be alert, because you don’t know either the day or the hour. Acts 1:7 (HCSB) — He said to them, “It is not for you to know times or periods that the Father has set by His own authority. What Is Bible Prophecy For, If Not "Date Generation?" Notice also in Acts 1:7 the mention, again, that the Father alone knows timing information. People seem to doubt that is true even when this is stated also in the Olivet Discourse where Jesus added that even he didn't know. The Father only really means the Father only. Now consider who Jesus is that he was left in the dark on this. Jesus is the Word of God made flesh (John 1:14). He is the one who transmitted the Book of Revelation to John (Rev 1:1) and is seen therein as the one who opened up the sealed scroll in Revelation (Rev 5:1-6:1). If he, being that great, did not know when, how is it that we have mere mortal men who think they can know what Jesus could not using the Bible? The stated purpose is to give us a list of events to watch for that tell us when the end is finally near. It compares these events preceding Jesus' coming just as green leaves appearing on the fig tree and all the trees before summer arrives. Likewise if we don't see any of the listed end time events, Jesus' coming is not near and we do not have to worry about it being imminent. God loves his servants and is going to give them plenty of warning and plenty time to take action when the time comes. What I wrote above represents my understanding and position on the issue of date setting for around a decade. It's still helpful for readers relatively new to prophecy so they understand that date setting theories are nothing to be deceived or impressed by. Be cautious. What is missing above that I failed to realize for so long was that date setting itself was not really the main issue or wrong of itself. The problem is with what the dates are attached to. They are attached to invented prophecies coming from the minds of persuasive, creative and often brilliant Christian men. When these men fail to understand the prophecies of the Bible literally and comprehensively, they tend to take an isolated piece out of its context and inject some of their brilliant insights from other fields like chronology or astronomy. For example, ignore what kind of blood moon the Bible is talking about and use the one coming up this year because it seems shiny and special for reasons X, Y and Z.
I say date setting is not wrong of itself because the prophets of the Bible set dates. Jesus set a date and said by one generation what he had just described would come to pass. Forty years later it (partially) did  (30 AD + 40 = the 70 AD destruction of the Temple). The difference? Jesus and the prophets attached dates exclusively to what the Word of God predicted already and never to their own imaginations or inventions loosely based on the Word of God. In contrast to this, Christians take a Scripture, pagan calendar or an astronomical anomaly and weave a new theory out if it using their own intellect and creativity and attach a date to that. Thus, things have gone afoul before the date is ever added because of they deviate from the Scripture-only or literal interpretation only. Only in recent years did I begin to zero in on "prophecy invention" as being the real issue, not the date setting. Jesus never prohibited date setting. Jesus stated that no man knew the date then, nor did he at that time. I think this means the Bible did not and does not contain it, either or he would have known as the Word of God made flesh. He never said no one would ever learn when the timing was later and attach it to an actual prophecy already in the Word of God. Don't use the Bible to calculate or conclude a single date (it can help to narrow rule out potential dates). This means to be successful at date-setting requires using literal Bible prophecy events (only, no invention) attached to dates that are based upon the Bible + necessary further revelation from God. The important distinction above between date setting and prophecy invention was key for me to recognize because, much to my chagrin and surprise, God would begin to give me Biblical insights and special further revelation (like #3 above) that would lead me to do my own date setting. Yikes. After two decades of actively debunking date setting theories, I was convicted to consider sharing the year I felt would be the commencement of end time prophecy myself. It was uncomfortable at first until I saw the positive effects it had on people who I had already taught repentance to. They repented harder because time might be short. The urgency helped them to focus and become less worldly. That encouraged me to go ahead and write up my convictions on the 2026 end timing  for a wider audience of all my supporters . Of course my date-setting is only attached to the literal prophecies I had already come to understand rather than some new invention like I had witnessed others do for decades. It started in 2012 on my birthday. God started on that day to give me prophetic dreams. They came in triplets or pairs to confirm each other, much like Joseph's or Pharaoh's dreams in Genesis did. Just like those, the dreams are never as plain as one would hope. Some of the meaning is immediately clear while years later other implications of the dreams come to light, either upon further insights, reflection or through the illumination of later dreams. Since sharing my convictions about 2026 from my dreams, God has led me to see more I overlooked from the same dreams that indicate a couple big things for 2022  that is found in literal Bible prophecy. Believe me it was uncomfortable to branch out in this way because I knew what would happen already: Some long time readers would be offended and some new readers would make a snap judgment that I'm like all the date setters listed above and accuse me of wrongdoing. "This is what Tim is convicted to share with the body (1Co 14:26) based on his understanding of the dreams he knows came from God. Test it for yourself per 1Co 14:29"
I don't blame or judge him; I used to see it the same way he did, black and white, leaving out "we see through a glass darkly" (1Co 13:12). It's hard not to with the nearly 100% failure record of Christians who do set dates. What he missed and I missed as well is that sharing dates for non-invented, actual Bible prophecies is not wrong if you feel God has given you special revelation about literal prophetic events in Scripture. If you're wondering what my dreams have lead me to share about 2026  and 2022  see the articles in the supporter content section .